The first step for an automatic warehouse is done with the use of special software. 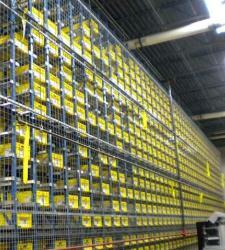 Going further a warehouse can be fully automated with use of robotic systems. Robots can pick and place products. Systems like that can be installed from a drug store to a car manufacturer factory. From a central console decides weather he wants to store or pick an item. Pick n place is done using predefined rules (older items are picked first for example). User can have reports, set alarms for expire dates at any time.